Thanks to the incredible foresight and persistence of Bruce and Annette Shepherd, the future for children with hearing loss in Australia is very bright. If you would like to pass on a special message of gratitude to Dr Bruce Shepherd on his 85th birthday, we invite you to email or post your message to us at [email protected]. 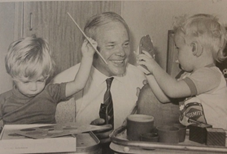 Donations made in celebration of Dr Bruce Shepherd’s 85th birthday will be used to honour Dr Shepherd, by helping children who are deaf and hearing impaired learn to speak and listen through our world-class early intervention programs and services.